A review of the electric water heaters for residential whole-house and point-of-use water heating, with the focus on tank-type and tankless heaters. Find out how electric models work, advantages, about main components, manufacturers, best models and are they a good investment or not. Electric water heaters are cheaper to buy but cost more to operate than gas type. Electric heaters are easier to install and do not need venting, while gas does. Electric models are simpler to use, service and maintain. Electric units are safer, there is no gas or product of combustion that could leak, including dangerous carbon monoxide – CO.
Electric is more efficient than gas and there is no heat loss through the venting system or pilot light. Electric heating is very quiet. Indoor air quality is better with electric models, as there are no products of combustion and leaks. Gas heats water faster and the recovery time is shorter. Gas models can run without electricity. Some gas models are Energy Star approved. Determine how much hot water is needed for your home. For the tank-type, it is enough to know the number of people that are going to use hot water. For the tankless, see how many appliances you will run at the same time and calculate how many gallons of water you need based on the chart below. Also, it is important to know what is the first-hour rating – FHR, or how much hot water is needed for the peak hour period. The most common sizes are 40, 50 and 60 gallons, but if you were happy with the performance and amount of hot water in your old unit, then go with that size. For 2-3 people, the recommendation is to buy a 40-gal unit, for 4-5 people buy a 50-gal unit and for more than 5 people go with the 60- or even 80-gal unit. If the temperature of the groundwater is 50 F and you would like to have hot water with the temperature of 140 F, and you are planning to run the shower, washing machine and dishwasher at the same time, look for the tankless unit which is able to provide 6 GPM (2+2+2) of hot water with the temperature rise of 90 F (140-50). For the shower, you need an average 20 gallons, for shaving 2 gallons, hands and face washing 4 gallons, food preparation 5 gallons and automatic dishwasher 14. Keep in mind that only 70% of the available capacity is available. So if you need 50 gallons of hot water, you would buy a 60-80-gal unit. Look for the high first-hour rating – FHR. FHR refers to how many gallons of water can be heated per hour and is especially important during peak hours of usage. Quality glass lining. Look for the models with the commercial-grade components such as the high-quality glass lining that is used as a protection against corrosion. The best models utilize a stainless steel tank. Self-cleaning system. Water heaters with the self-cleaning system are less prone to sediment buildup, decreasing performance and low efficiency. Incoloy heating elements with dry-fire protection. These are high-quality heating elements made of stainless steel that is protected by the control system from burning out and when the tank is not full of water during startup. Incoloy heating elements are known for good corrosion resistance, strength and oxidation resistance in both hard water and high-temperature situations. Commercial grade or powered anode. Powered anodes are the best option as they are not sacrificial, as the non-powered ones. They last very long and do not require maintenance. Brass draining valve. Economy value heaters are usually equipped with the plastic drain valves, while better and best models with valves made of brass. Electronic user interface. Advanced models usually come with the electronic user interface, diagnostic system, and display. Wi-Fi. Wi-Fi capability to control the water temperature remotely. Warranty. The best model usually come with the longer warranty, such as 12 years. 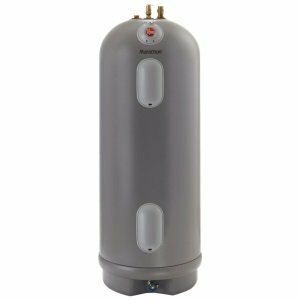 Electric hot water heaters with the storage tank are the most popular type in the US and Canada. They are big, heavy, but reliable utilizing proven technology. There is a variety of types such as the conventional tall, medium or short, Lowboy, Tabletop, POU (point of use) where the models with the 50-gallon capacity are the most popular. Users and plumbers love this type because they are simple, easy to operate, service and troubleshoot, no venting is required, can be used in the majority of homes and are cheap. Conventional electric water heaters utilize one or two heating elements (lower and upper), for water heating and corresponding thermostats for the temperature control. As the heating elements are fully immersed, they are able to transfer more than 90% (even 99%) of the heat. Either the tap is open or not, water inside the tank is being heated and kept at the pre-set temperature. Cold water from the home plumbing fills the tank through the dip tube, which is submerged almost to the bottom of the tank. One of the heating elements is turned ON when the thermostat senses that the temperature of the water is below the set value. Every heating element carries the thermostat which is mounted against the tank surface. When the hot water tap is open, hot water from the top of the tank is drawn, and since the level drops, fresh but cold water gets inside the tank. The lower temperature initiates the heating elements to heat the water to the set value. Once it reaches the set value the thermostat turns the heating element OFF waiting for another "call". Electric hot water heaters are equipped with safety elements also, such as the high limit switch that prevents water from boiling or reaching the temperatures over the given on the thermostat, and in the case, if the thermostat fails. 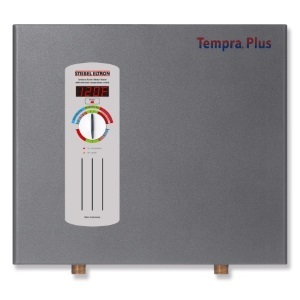 Tankless electric water heaters are small, wall-hanging, and provide hot water only when there is demand. These are often installed under the sink and used at the point of service while delivering hot water in an endless and continuous supply. As they heat water while it is moving through the heat exchanger so there is no standby heat loss. With the on-demand heating water is always fresh, delivered fast and with substantial energy savings. Electric water heaters with the tankless technology heat water on demand. They don't utilize the tank, but the heat exchanger where water is heated, they are small and most of the time are wall-hanging. Tankless models produce an endless hot water and only when there is demand. A great example is Stiebel Eltron and its popular model Tempra, DHC and DHC-E models. When there is a "call" for hot water (the tap is open) cold water passes over the heating element and is heated instantaneously. Based on its power, the tankless water heater can supply one or more fixtures at the same time while working as the point-of-use or whole-house heater. Heat pumps or hybrid heaters are ultra-efficient electric heaters that provide high energy factors of two or more, are Energy Star compliant and eligible for tax credits and rebates. Heat pumps are great for the attic, garage and basement installation. It is the favorite type of those homeowners who are looking to go "green". The most popular are AO Smith, GE GeoSpring, and Rheem. When searching for the best electric water heaters look for the high efficient models. These units save energy, heat fast, but are not Energy Star compliant. Actually, none of the electric tank- and tankless-type heaters are eligible for government grants, unless they utilize the heat pump technology. Heat pumps are the only electric appliances that are Energy Star approved. If you prefer proven technology and traditional, bulky water heater, and your family has 4-5 member go for the 50-60-gal unit. This type will be enough to deliver hot water to every application of your home. If you lack in space and would like to have an endless supply of hot water, which is heated on demand only, go with the tankless option. Tankless never runs out of hot water, as long as you have an electric connection, it conserves energy and water as you don’t have to wait for the heater to heat up, it is convenient to use, easy to install and very safe. And it costs less.